ArcGIS Server provides robust GIS capabilities including mapping, linear referencing, network tracing, geocoding, editing, and spatial query. ArcGIS 9 introduces a new technology for supporting enterprise geographic information system implementations. ArcGIS Server is the first GIS enterprise application server that implements GIS business logic (previously available only in GIS desktop solutions) in an information technology (IT) standards-based server environment. ArcGIS Server will add new information visualization and analytical capabilities to existing enterprise applications significantly enhancing business decision processes within many organizations. This means that organizations will be able to utilize their corporate information assets more effectively through new and innovative techniques that exploit the locational context of their existing data. ArcGIS Server gives organizations the power to build shared server applications that deliver highly focused GIS applications. This technology will open up a whole new type of enterprise GIS implementation that provides centralized application support and data management. "For some users, we see this technology moving GIS into the same enterprise category as enterprise resource planning (ERP) or customer relationship management (CRM)," says Jack Dangermond, Esri founder and president. "This technology will produce a new group of spatial information consumers, knowledge workers who are not trained GIS professionals, who will benefit from access to the information provided by custom-tailored GIS-powered applications." 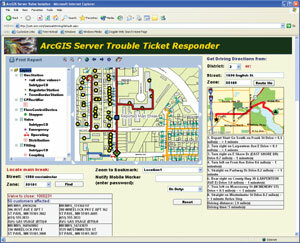 ArcGIS Server provides a wealth of server-based GIS functionality. ArcGIS Server capabilities include mapping, geocoding, spatial queries, editing, tracing, and high-end analysis. Examples of applications that developers can build for end users who do not have a desktop GIS include facility network modeling, property management, land records, forest management, transportation monitoring, customer service, geomarketing, logistics planning, and dozens of others. Because all processing capabilities are centralized, software updates do not need to be installed on hundreds of PCs. This significantly reduces the administrative cost of version synchronization, certification, and installation across the organization. GIS enterprise application server software can be implemented on an organization's standard server hardware, and the same IT staff can be used to maintain both. As more users need to be served by enterprise GIS applications, capability can be easily increased by upgrading the memory or disk in an existing server machine or by adding additional ArcGIS Server instances. The load can be readily shared and balanced between these multiple instances with the administrative tools specifically designed to support system administrators. ArcGIS Server adheres to IT standards, providing maximum interoperability and compatibility with enterprise architectures using any of a variety of popular programming languages, development environments, commercial application servers, and database management systems (DBMSs). Key standards, such as Java, .NET, and Extensible Markup Language (XML)/Simple Object Access Protocol (SOAP) for messaging and data transfer over Web (HTTP) network connections can be used to build local and wide area network enterprise applications. Such standards offer a rich environment with maximum flexibility for communicating with the organization's heterogeneous operational applications and information assets, thus fostering the implementation of true enterprise applications. 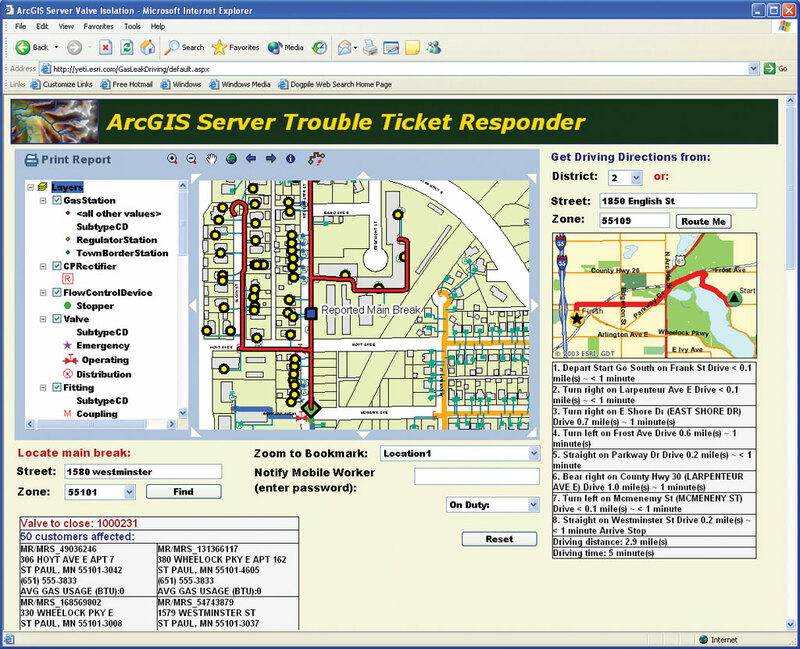 According to David Sonnen, senior consultant for spatial information management with IDC, the market intelligence and advisory company (Framingham, Massachusetts), "ArcGIS Server exposes the full depth of Esri's geoprocessing capabilities using open, standards-based application program interfaces (APIs). This standards-based approach allows ArcGIS Server to provide geospatial capabilities to a wide range of distributed users. We believe that ArcGIS Server represents a significant technological step toward the broad use of geospatial technology within enterprise information systems." ArcGIS Server supplements Esri's existing stack of GIS enabling technology consisting of ArcSDE, ArcIMS, ArcGIS Desktop, and ArcGIS Engine. ArcSDE provides the enabling infrastructure necessary to manage multiple users editing the geometry of the same spatial database with long transactions, alternate versions, and history. ArcIMS is a cost-effective solution for Internet spatial data visualization, providing exceptional performance for high-volume map requests, as well as metadata search and management services. ArcGIS Desktop (ArcView, ArcEditor, and ArcInfo) is used to create and edit spatial data, provide out-of-the-box spatial data exploration and analysis capabilities, and manage the administrative services of ArcGIS Server. ArcGIS Engine is used to build custom desktop applications that can operate as stand-alone applications or as ArcGIS Server clients. The underlying architecture for the entire platform is an open development environment known as ArcObjects (see "ArcGIS 9 Is the Development Platform for Building GIS Systems"). Unlike ArcView, which is an end user application, ArcGIS Server is for developers who want to build shared server applications that contain advanced GIS capabilities in both a Web services and client/server environment. For example, an organization can use ArcGIS Server to deliver highly focused GIS applications (e.g., mapping, geocoding, analysis) to end users who do not have a desktop GIS. These advanced GIS capabilities are similar to what a user would perform within a desktop application, yet can be provided effectively and efficiently over the Web. GIS technology is being incorporated into the IT infrastructure because of its proven ability to improve operational efficiency and decision making within an organization. Members of the IT staff will take investments already made in spatial data and develop new applications that cut across the organization and are available to anyone in the enterprise. Sharing spatial information between and among departments will become commonplace, like the sharing of financial or other tabular data today in an ERP system. In the next few years, server-centric GIS will emerge as a significant complement or, in some cases, an alternative to desktop systems. ArcGIS Server represents a significant milestone in Esri's software development strategy that will further integrate GIS within the larger IT environment so that the benefits of spatially enabled information can be shared with a greater number of people at a lower total cost of ownership. The standards-based approach makes ArcGIS Server ideal for providing GIS capabilities to a wide range of distributed users. In addition, the lower cost of ownership and scalability means that organizations can create compelling business cases that demonstrate a tangible return on investment. As a result, we expect numerous organizations new to GIS to build systems based on this architecture and many existing GIS organizations to leverage their existing systems with a GIS enterprise application server. ArcGIS Server is a new product that will become available at version 9. For more information, download the white paper from www.esri.com/arcgisserver.